Arriving at the work site, we three teenagers climbed down from the truck. “Grab the shovels and rakes,” the foreman said, and follow me.” He led us to three giant piles of earth dumped near two oil storage tanks. Our job was to shape these huge mounds of earth into a neat, square dike to surround the tanks. I wondered briefly if I had been selected for this project because I was a Dutchman. We stopped and heard the roar of a large diesel engine starting up, and, from behind the tanks, a bulldozer lurched into view. All right! Suddenly, with that rumbling resource, our intimidating task appeared much more doable. It reminded me of Pentecost. Jesus—the Foreman—had given His disciples—the Church—the task of evangelizing the world and discipling the nations. He had also told them to wait. Wait for the sound of the rushing mighty wind of the Resource, not in the form of a bulldozer, but of the mighty Holy Spirit, God Himself, to empower them for the immense task. “Follow the Holy Spirit,” their Foreman instructed. His instructions are still valid for the Church, the multi-national, multi-cultural, multi-dimensional Church living, growing and working all over the world today. Not only must a billion believers around the world depend on our Resource to evangelize the world, we also need to rely on Him to provide everything we need to meet the challenges and difficulties in our lives. I remember some years ago when my wife, Jo, had just had the third surgery on the same hip with another one to come. I asked the nurse in charge what we could do to lessen the pain and increase Jo’s mobility after this unwelcome complication. Really? Are we simply to accept whatever happens to us, hang in there somehow, and grimly endure it? That attitude is pagan fatalism. Many cultures around the world are infected with this idea that everything that happens is inevitable, that we are all helpless in the grip of blind fate. Fortunately, the Good News of Jesus produces an utterly different attitude. Jesus introduced us to an all seeing, all loving, and all knowing God, not an unknowing, uncaring, blind fate, He personified the God who is personally interested in each of His creatures, loving them so much, He became one of us to live, suffer, die and rise again from the dead to set us on the right track. Our God wants to rescue us from our hellish worldviews, and give us a clear view of Himself as the centre of the Universe and of our lives. Our God Himself is the Great Resource, our Heavenly Bulldozer, who goes before us. Jo and I got through those surgeries by depending on our Resource. We had depended on Him on earlier occasions—a decade of fiscal distress, five years of confusion and depression during intense opposition to our life’s work, and were about to enter more stressful years when our grandson developed seizures and had brain surgery which left his body weakened on one side. 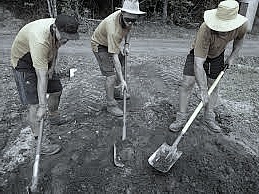 Jesus does not leave us to face an impossible task with shovels and rakes. His Holy Spirit fills and empowers us to deal with whatever comes into our lives in a God-honouring way. Not fatalistically grinning and bearing it, but courageously, knowing that we can do all things through Him who strengthens us. All over North America last Sunday, we celebrated and honoured our mothers, a stark contrast to the way some societies denigrate women. This got me thinking about history. It’s only recently that women have been treated relatively equal with men even in our more “enlightened” western societies. In 1900—only 115 years ago—Canadian provinces began granting women the right to vote. Quebec, in 1941, was the last province to do so. Switzerland, although famously democratic, didn’t give women the right to vote until 30 years later in 1971. Both Quebecois and Swiss societies have a Roman Catholic heritage and were heavily influenced by Greco-Roman culture. It is, therefore, interesting to note women’s social standing in Athens and Rome during the first century AD. In Greece and Italy two-thirds of the adult population were not allowed to participate in politics—the slaves, and the free women. Thus, although democracy was invented by the Greco-Roman culture, only one-third of the adult population had a vote or could hold office, namely the adult free men. This, sexist, anti-woman, Mediterranean cultural attitude stands in stark contrast to early Christianity which taught that men and women were equal before God. The apostle Paul stated it succinctly, “There is neither Jew nor Gentile, neither slave nor free, nor is there male and female, for you are all one in ChristJesus” Galatians 3:28. Jesus Himself deliberately chose to reveal some major theological truths, not to his male disciples, nor to male Jewish religious authorities, but to women. It was to Martha He disclosed His power over death, “I am the resurrection and the life. He who believes in me will live even though he dies” John 11:25. It was to a woman from Samaria that, for the first time, Jesus clearly stated He was the long-awaited Messiah. When she brought up the subject, He told her, “I that speak unto you am He.” John 4:26. In the same story, the disciples, steeped in their pre-Christian, Jewish culture, were surprised that He did the totally unexpected—talk with a woman. A large number of disciples followed Jesus besides the twelve men He chose. Many of these disciples were women, and Jesus taught them as any Jewish rabbi would his male students. In one incident, when He was teaching inside a house, He was told his mother and brothers were standing outside wanting to see Him. “Mary sat at Jesus feet, listening to what He said.” Luke 10:39. The expression “sitting at the feet” of a rabbi was used to describe a disciple receiving instruction from the rabbi. 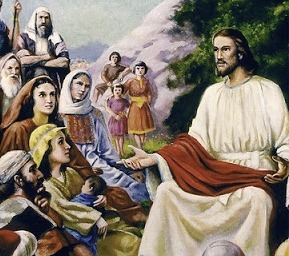 Jesus was a radical who constantly went against the culture of his day by treating women as equal in His sight to men. The early church also valued women in various leadership, teaching and prophetic roles and called them disciples, a term, until then, reserved for men only. “In Joppa there was a disciple named Tabitha who was always doing good and helping the poor.” Acts 9:36. When this woman died, Peter came, prayed for her, and raised her back to life. A major, notable miracle, performed on behalf of a woman! And the women disciples not only “helped the poor” they preached and taught as well. At the end of one of Paul’s missionary journeys Luke mentioned them staying with an evangelist named Philip and specifically stated that he had four virgin daughters who prophesied. Acts 24:9. The Bible is not sexist, or anti-woman, and neither are churches and individuals who are willing to stand against the pagan Greco-Roman culture that has influenced so much of western civilization. Biblical Christianity has always taught the concept of gender equality—that women and men can both participate equally in every area of life. This includes politics, women not only vote, but, as is currently the case in Alberta, are also elected in record numbers as members of the government, and even as the top leader in the ruling political party. Exactly seventy ago, Canadian soldiers fought their way through Holland to Hilversum, our town, and freed us from fear and oppression. I was seven years old when Papa took me to see the Canadian tanks growl along Main Street. 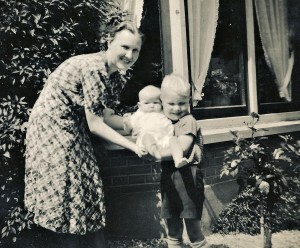 Thank you, Mama, for shielding me from so much of the horror of war. I was only two years old when the enemy overran our country. You sheltered me, but you could not insulate yourself from the daily stress. You and Papa tried to live a normal life. The year the war started, you gave me a little brother, and cared for him day and night for nine months until he finally died of an inoperable heart defect. I wonder if you ever got over that strain and loss. Two years later, you gave me a little sister, and two years after that another little brother. All this time you wondered where you would get enough food to feed us all. I remember waking up many nights to the sound of gunshots in the neighbourhood. Eventually it became normal and I slept right through it. But did you? How could you, when you knew Papa was out there, in the night, after curfew, bartering for food? How could you sleep when you didn’t know where he was, or if he was safe? How did you live through that time he was gone for weeks and finally arrived with one jug of cooking oil? When the grain for porridge was gone and there were only two potatoes left in the bin, I didn’t know. But you knew. In the meantime, Pake and Beppe, your parents in Friesland, had hidden a sack of potatoes in a fishing boat that was coming our way. You must have prayed so much for God’s protection over that sack of potatoes. Thank you, Mama! I ran to the house one afternoon, excitedly pounding on the door to be let in, shouting, “De moffen komen eraan!” ( The German soldiers are coming!) You quickly yanked me indoors and shushed me, reminding me to whisper, not shout this warning. I explained that soldiers had blocked off both ends of the street and that they were picking up men to transport them to slave labour camps in Germany. Then I watched as Papa quickly dragged the buffet in the back room away from the wall, rolled back the carpet, yanked open a trapdoor, and clambered down into the darkness. I helped you push everything back into place. I was only five years old and it didn’t bother me that Papa lived under the floor so often. But no doubt, it bothered you. How could you sleep when you knew that any night, at any moment, rifle butts could pound our front door and Papa would have to rush down the stairs into his hiding place? In the last winter of the war, trains no longer ran into Germany: all the railway bridges had been bombed, and so the threat of slave labour raids stopped. Papa came out of hiding; we got our bicycles out of hiding too. One day Papa took me for a bike ride out into the country. When we returned, I excitedly told you about the fun day we had. No doubt you prayed hard during that “fun” day: not only for our safety, but that the rabbit would not be confiscated. Thank you, Mama. Then, finally, liberation! No more hiding under the floor. No more blackout shutters. No more hunger. No more waking up from shots in the night. No more confiscation raids, for food, bicycles, radios and men. No more listening to the BBC news in Dutch on earphones from a secret radio hidden above the linen closet. No more night curfews. No more food smuggling. No more trains of boxcars with begging hands sticking out through the cracks in the boards. No more women and children only in public. Thank you, Mama, for looking after me during those terrible years. PS: And you 7,600 Canadian mamas—you whose soldier sons died to liberate our country—Mama and I continue to thank you for your sacrifice.